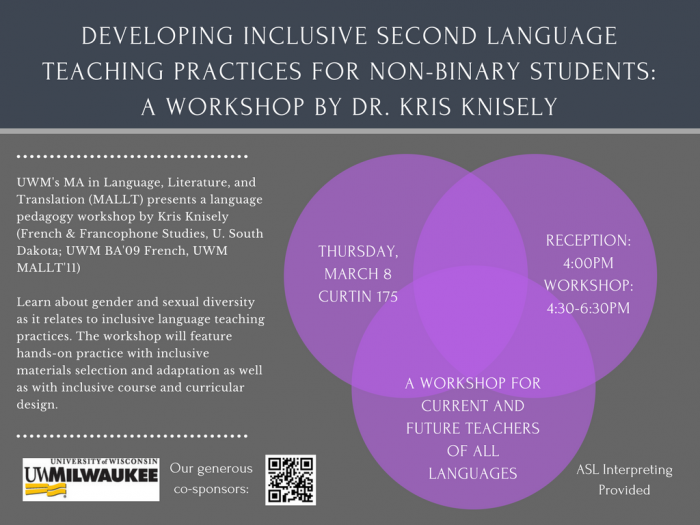 Dr. Kris Knisely will discuss gender and sexual diversity as it relates to inclusive language teaching practices. He will first provide a broad introduction to working with students of diverse gender identities in the language classroom. Then, he will use examples from the linguistic practices of non-binary individuals in France in order to outline how all language classroom discourses and activities can be adapted to be more inclusive. He will focus particularly on how, as pedagogues, we are to address binary grammatical gender with students who have non-binary gender identities. A number of strategies for increasing inclusiveness and supporting diversity in all second language classrooms will be presented and discussed. This workshop, intended for current and future teachers of all languages, will feature hands-on practice with inclusive materials selection and adaptation as well as with inclusive course and curricular design. Bio: Kris Knisely (UWM BA’09 French; UWM MA’11 MALLT-French) earned his PhD in French and Educational Studies at Emory University in 2015 and is now an Assistant Professor and French and Francophone Studies Program Director at the University of South Dakota. His research focuses on identity as it relates to the teaching and learning of French as a second language, with a particular focus on gender and sexuality. His work has appeared in The French Review, Contemporary French Civilization, Gender and Language, The Journal of Applied Measurement, and Pensamiento Educativo. Free and open to the public, with ASL interpreting provided. We particularly welcome current and future language instructors at all levels from other area institutions! Co-sponsors (still being updated) include: Center for Celtic Studies; Electa Quinney Institute for American Indian Education; French, Italian, & Comparative Literature; Latin American, Caribbean, and U.S. Latin@ Studies; LGBT Resource Center; LGBT Studies; Sam & Helen Stahl Center for Jewish Studies; Spanish & Portuguese; and Women’s & Gender Studies.